Red Sox are in Swing Again! Calling all Red Sox fans! Join I Paint Today for a fun night of painting on April 23rd here at I Paint Today beginning at 7pm. The cost is only $28 per person and includes all supplies. Use Promo Code GOREDSOX for $5 off. The “Red Sox are in Swing Again” Paint and Party event is for teens and adults and will certainly be a must attend event for Red Sox fans! Lets support our Red Sox and the beginning of our much anticipated baseball season by painting your own piece of Red Sox memorabilia. “Red Sox Rules” will be a great addition to your collection. Come celebrate the return of baseball as the Red Sox begin their 105th season at Fenway Park. 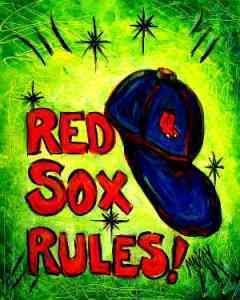 We will eat, drink and paint RED SOX, It doesn’t get any better than this!